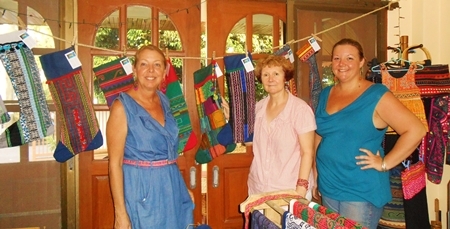 (From left) Barbara Grafstrom, Jane Roskell and Amy Grafstrom held a holiday fair selling Arun Thai Natural, 100% natural body care and massage products, hand-made in Thailand under fair trade, sustainable and not tested on animals as well as Siamese Dream Design, specializing in unique fashion and home decor items from repurposed indigenous textiles. The next event is “Sipping & Shopping: Sustainable Holidays” on Wednesday, Nov. 7th from 1:30 pm to 7:30 pm at 9/13 Moo Baan Ingdoi on Canal Road. Anurak Napawan, District Governor 3360 Rotary International and the Rotary Ann Amporn Napawan visited the Rotary Club of Chiang Mai Airport. 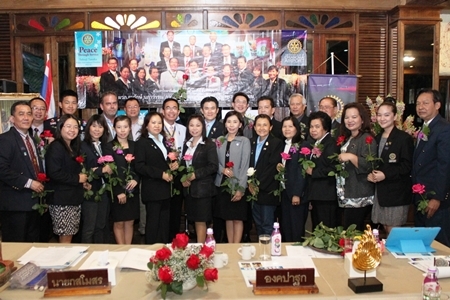 Management Annual Meeting 2012-2013, Rotary Club Assembly and welcomed new Rotarian member at Huan Huaykaew Restaurant on October 26, 2012. Mr. Thanet Kijjaharn, a Social Science Teacher at Lamphun Technical College attended the Care For Dogs Adoption Fair at Central Airport Plaza recently and took home his new friend for life, Calvin. For more information on how you can find your best friend contact www.carefordogs.org. 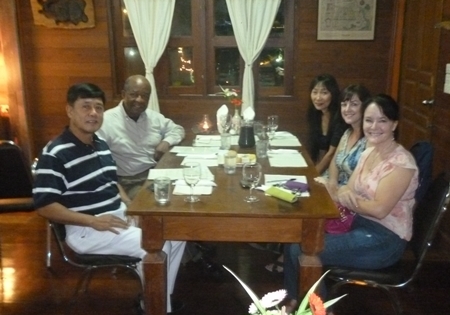 (From left) Maj. Gen. Bhumiphat Chawiphat joins Phillip Johnson of In Focus 4 You, LiLi Tan, Randi Egan of Miguel’s Restaurant in Nong Hoi and Shana Kongmun of the Chiang Mai Mail for dinner at Peter van Loo’s restaurant Des Gourmet on Canal Road recently. Kantary Hills Hotel Chiang Mai welcomed ‘Wake Club’ TV Variety Show hosts Knot Akaranat Ariyaritwikul (left), Sean Chindachote (right), and their celebrity guest Aof Pongsak Rattanapong (3rd left) who were warmly welcomed by Kantary Hills Hotel, Chiang Mai Reception Supervisor Thawee Utama (2nd left), when they stayed at the hotel to film in Chiang Mai recently. Chiang Mai Mail’s newest food reviewer Christopher Sujarit celebrated his birthday on Tuesday, October 16, 2012 with Vera “Toom” Ramasute owner of the New York New York Hair Salon on Nimmanhaemin Soi 13, well known for the giant Marilyn Monroe on the front.